Peanut butter is a delicious ingredient in all sorts of dishes: satay skewers, PBJ sandwiches, cupcakes and lots more. My favourite use for it has to be peanut butter ice cream. This recipe offers a rich, creamy ice cream with a touch of salt to balance it out. 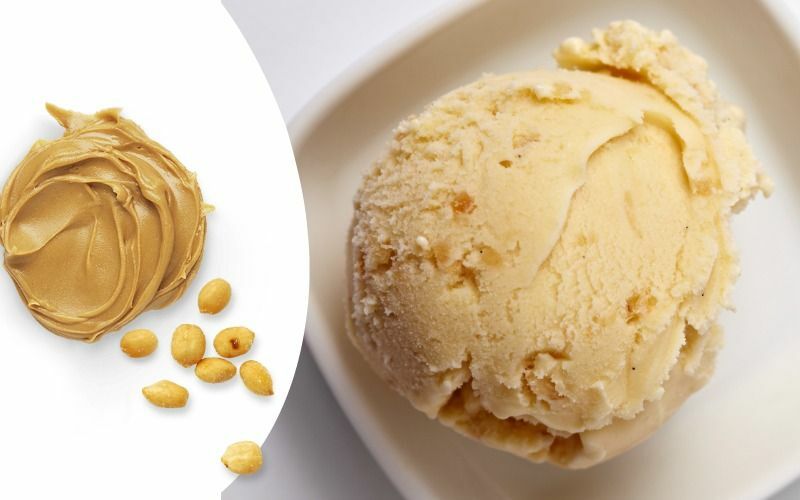 Crunchy peanut butter gives some good texture to the ice cream but the version pictured here uses smooth. There are other peanut-free alternatives like almond butter which would work well also. If you’re feeling really inspired you could have a crack at making your own butter. To give your ice cream a bit more excitement, swirl in some chocolate or caramel sauce as the ice cream has almost finished churning. Another option is to streak in ribbons of jam for the ultimate PBJ experience! Peanut butter ice cream in a waffle cone. Using an ice cream machine like this one will make your life a lot easier and will produce better ice cream. If you don’t want to buy one, then you can follow the steps below. Follow the recipe below up until step 5, then add to the freezer. After half an hour remove and beat until nice and smooth then continue freezing. Repeat this step every 30 minutes until it gets too hard to beat. You’ll need to work fast when you remove the ice cream. You don’t want it to melt as this will result in an icy textured dessert. Heat milk and cream in a medium saucepan over a medium to high heat. Stir until the mixture is simmering, do not boil. Then remove from heat. Whisk egg yolks and sugar together until well combined. Slowly pour 1 cup of the hot liquid into the yolks, all the while whisking. Add the yolk mixture back to the remainder of the milk mixture along with the peanut butter and continue to heat until it thickens. Do not boil. Transfer the custard base to an airtight container and leave in the fridge for at least 3 hours, preferably overnight. Churn the custard base in your ice cream maker as per the manufacturer's instruction. Once churning is complete, add to freezer in a plastic container to harden for 2 hours. Feel free to reduce the egg yolks for a lighter ice cream. I find 6 yolks works well though. Top your ice cream with crumbled chocolate biscuits or caramel sauce. 2 Replies to "Peanut Butter Ice Cream"